By default, the Unsharp Mask filter sharpens every pixel in a selection. However, you can instruct the filter to sharpen only the edges in an image by raising the Threshold value from zero to some other number. The Threshold value represents the difference between two neighboring pixels — as measured in brightness levels — that must occur for Photoshop to recognize them as an edge. Suppose that the brightness values of neighboring pixels are 10 and 20. If you set the Threshold value to 5, Photoshop reads both pixels, notes that the difference between their brightness values is more than 5, and treats them as an edge. If you set the Threshold value to 20, however, Photoshop passes them by. 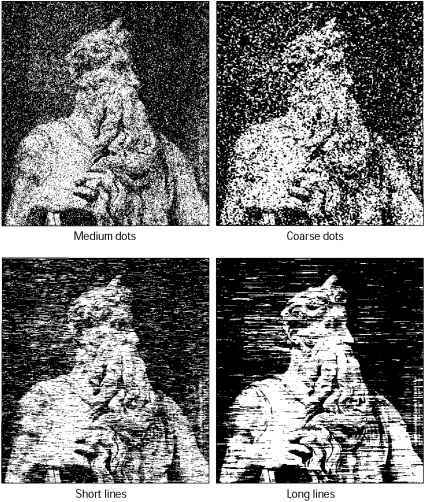 A low Threshold value, therefore, causes the Unsharp Mask Filter to affect a high number of pixels, and vice versa. In the top row of images in Figure 10-12, the high Threshold values result in tiny slivers of sharpness that outline only the most substantial edges in the woman's face. As I lower the Threshold value incrementally in the second and third rows, the sharpening effect takes over more and more of the face, ultimately sharpening all details uniformly in the lower-right example.